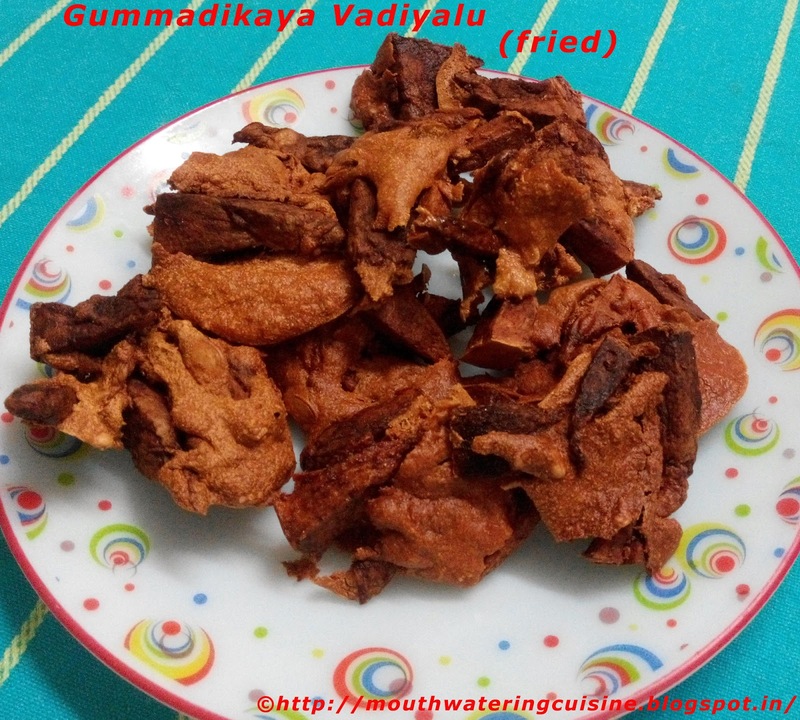 Vadiyalu or any sun dry items are very popular in Telugu people's menu. Of all of them ash gourd vadiyalu are very famous. It goes well with dal, rasam and sambar. We should not think about calories while making them as we have to deep fry them in oil. It needs a little strength and patience to make them. For making them we need to start some preparation a day before. Cutting of ash gourd, tying them in a cloth and putting some heavy weight on it...so excess water from the gourd will drain out. This process should be done a day before only. We do not cook anything here, only once they are dried completely we can deep fry them. Along with the skin cut ash gourd into small pieces. Some crush them in traditional mortar and pestle and some grate them, but we in my house cut them into small pieces only. That is our choice. 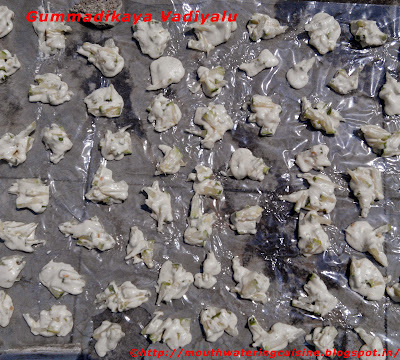 Take a thin and huge cloth put these pieces in it and tie them tightly, so that excess water in the gourd drains out. This process we do it a day or 10 hours before making vadiyalu. Soak black gram for 8 hours. Grind it to a fine paste. Add only required amount of water to move the grinder smooth. Be careful while adding water, the batter should be as thick or even more as that of vada batter. Grind green chillies, salt and cumin seeds into a smooth paste. Mix the gourd pieces, black gram batter and green chillies paste together. Mix them well with hands. Do this process just before placing vadiyalu. 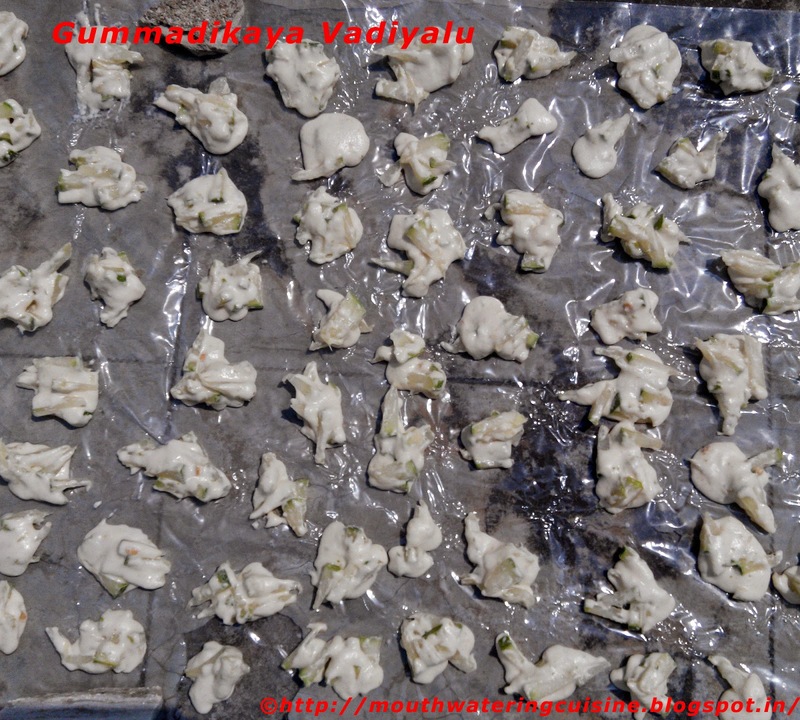 Spread a plastic sheet under the Sun, Place very little amount of batter to make vadiyalu with help of a spoon or with hand. Allow them dry completely for two days. After first day drying flip them to dry faster and complete. Heat oil in a kadai, drop each vadiyam in oil. Fry them till turn brown colour. Serve fried gummdikaya vadiyalu with dal, rasam and sambar.